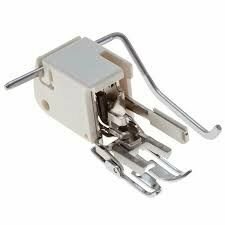 Many sewing machine companies call this foot the “Even Feed” foot, The walking foot is for sewing multiple layers of fabric togetherIdeal for Machine Quilting and sewing rubber backed curtains and even stripped materials. Ideal for sewing inflexible materials such as leatherette. Ideal for applique. Use an open toe version so you can see where you are going.